By VICTOR H. FERRY, Ph.D. It has been over ten years since the Columbine tragedy and several other rather high profile school terrorism incidents. As a school safety, security and emergency management consultant since retiring in 1997 after 35 years in public education, 28.5 of these as a school principal, and 24 of these within the shadow of three active nuclear power plants, I find it a bit disturbing that much remains to be done in these separate and distinct fields. The paradigm for educator training has changed in some regions, but there is a great disparity among regions and what is required as pre certification to take charge of our nation’s young. Consistency in knowledge about various safety aspects of school operations goes well beyond basic common sense and schools typically take reasonably good care of children entrusted to them, however there are incidents that give us all pause and cause us to ask why a tragedy happened. It would be easy to cite specifics regarding dramatic weapons in school cases, but my preference is to focus on anticipation, preparation and remediation issues. For example, at a recent (November, 2009) Region 1 (New England) Federal Emergency Management Agency sponsored conference on higher education preparedness, a question was raised by a well respected school safety expert, “When is it advisable to ignore a school fire alarm activation?” Now, this notion gave the group pause for a moment and involved an aspect of school safety planning that really needed to have taken place well before an incident. The most acceptable time would be during a lockdown already in place, but again, this scenario would correctly need the agreement of the local fire officials and have been discussed in advance as part of “what if” planning. That FEMA is taking an awareness lead is highly commendable and what is needed is for higher education officials, who are responsible for educator training, to follow through with teacher and administrator training that includes basics and some sophisticated training in safety, security and emergency management. The world has changed and the paradigms underlining the education profession have been altered a bit in terms of priority. The first responsibility of educators entrusted with America’s young is their safety and welfare; education of our young remains educators’ primary function, but their primary function is always trumped by the primary responsibility for safety and welfare issues; always. Yours truly is one of those retirees who land travels the nation and enjoys meeting folks while on the road. I have traveled from Maine to Texas and Florida to Alaska, always taking time to chat with folks native to a region. When I get around to asking about school SS&EM planning it is rather disappointing to hear educators (mostly classroom teachers) tell me they have had little or no training or are unaware of their school’s EM plan. This should not be. It simply should not be. Now, there are pockets of excellence that counteract this unscientific observation. There are places that practice lockdowns, evacuations, communications drills (including glitches in such) and reunification procedures after a supposed incident. These same districts conduct regular planning sessions and tabletop drills with all emergency services available in a given community and region. There are education and community service leaders doing what’s correct and ascertaining what needs to be done, but there are far more planning to rely on outside leadership assistance in the event of a tragedy. The paradigm change here is this: The first responder is actually the first person on the scene of an incident. Of course, the first action may be to call for assistance, but in the 4 minutes it takes for help to arrive (average local response time for emergency responders to get to a scene) critical safety actions need to be enacted by folks on the scene. This is where knowing what the plan requires and what emergency response professionals need comes into play. For those readers unfamiliar with on scene, career emergency responder times, typical is 4 minutes for local responders, 4 hours for state level responders and 4 days for major federal assistance. These statistics alone make a case for consistency in educator training in basic safety, security and emergency response. Ok, so now the issue of a need for consistent educator training has been raised. Where might one obtain such training? Well, this is relatively simple and very cost effective. Simply go to FEMA.gov and research the independent study courses available on line. Many communities are requiring employees to take IS-100 and IS-200 and the NIMS course (National Incident Management System). Education officials need to know about ICS (Incident Command System) in order to best and fully understand what is occurring at a disaster scene. My favorite text is, “Are You Ready, an in depth guide to citizen preparedness,” available free by calling FEMA publications and asking for IS-22. If you are an educator, a Facilitators Guide with CD is also available, all for free by calling 1-800-480-2520. While such courses and texts build knowledge, these do not take the place of interactive classes where experienced responders assist in developing plans, procedures and desired outcomes. The reader is obviously aware this piece is being written for www.AmericanSchoolSafety.com, a corporation based in Connecticut and one of the leading school safety entities in our nation. Its CRK, or Crises Response Kit, contains the most comprehensive template for developing a school safety, security and emergency response program with which I am familiar. It is worth exploring when time is of the essence in developing and implementing a customized plan. A key component is the involvement of the total emergency response and recovery community, ongoing updates and the availability of on-site training assistance through known, trusted, experienced and proven consultants who have a broad experience with actual school safety, security and emergency management. A retired school administrator with extensive experience in emergency management and school safety, Dr. Victor H. Ferry is the former principal of a school within the shadow of three nuclear power plants for 24 years. Dr. Ferry has authored localized school-level nuclear emergency guidelines and served as project consultant for the award-winning Guidelines for Safe Schools and Emergency Management. For additional information contact American School Safety: 866-531-6560 or click here to contact us today. Canton, CT — February 23, 2010 — AmericanSchoolSafety.com, LLC, a leader in the development and delivery of school safety products and services, today announced the issuance of U.S. Patent # 7628275 for its Crisis Response Kit® (CRK), the first and only kit of its kind designed for use by schools, higher education, institutions, businesses, hospitals, day and elder care facilities in emergency and crisis situations. The CRK provides specific guidelines in planning for, training and practicing adopted protocols and procedures to address site based emergencies. Providing a simplified yet broad-based application that can be used at any building or facility to effectively plan, prepare, and respond to emergencies, the CRK is easily adaptable for workplace installation, and compliments OSHA, NFPA and Department of Homeland Security standards. The patent recognizes both the emergency preparation methodologies as well as the comprehensive crisis resource kit designed specifically for use in emergency situations. More particularly, the CRK provides administrators, teachers, and personnel with the procedures, tools, communication devices, crucial contact information, and critical logistical data required to successfully respond to a host of emergency situations until such time that first responders can assume control. The Educational Sector CRK is currently licensed for sale by American School Safety.com for use in educational facilities within the United States, including but not limited to, pre-school, K-12, tribal nation schools, colleges and universities, and vocational technical schools. 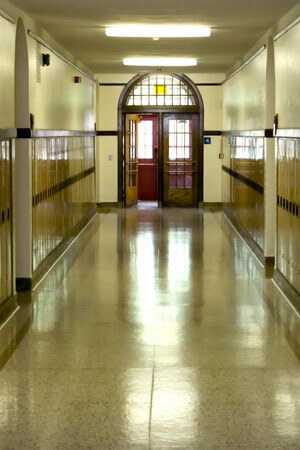 AmericanSchoolSafety.com, LLC is a national network of licensed security professionals with more than 30 years’ experience in providing comprehensive safety audit and assessment services to educational institutions throughout the U.S. 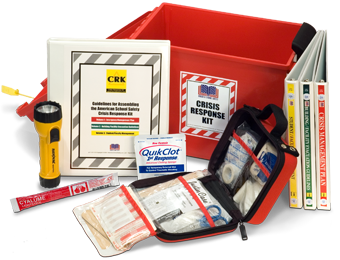 The patented AmericanSchoolSafety.com Crisis Response Kit® (CRK) is designed for use during building emergencies and critical incidents; and for the training and practice of situational response drills. For additional information regarding American School Safety seminars, products and services call 1-866-531-6560, e-mail info@americanschoolsafety.com or visit the web site at www.americanschoolsafety.com. 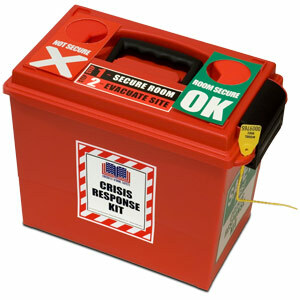 The Crisis Response Kit® is provided under licensing agreement to AmericanSchoolSafety.com, LLC. ©1999-2015 AmericanSchoolSafety.com, LLC. All rights reserved. 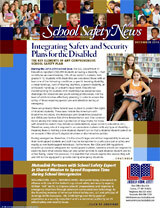 The December 2015 Issue of School Safety News is Available in PDF format.